I was contacted by the FMDSA and doctors involved in a recent study that examined the relationship between Fibromuscular Dysplasia (FMD) and pulsatile tinnitus. Below is an image capture of the chart that they've provided permission for me to reprint. For a link to the file in printable, .PDF form, look under "Resources" on the right-hand side of this page for the file, "Article: Unraveling Pulsatile Tinnitus in FMD; A Report of the United States Registry for Fibromuscular Dysplasia." 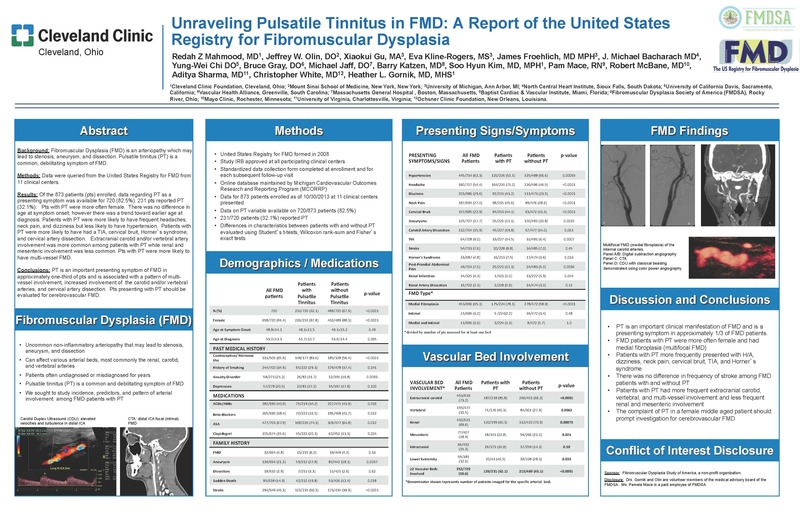 "Unraveling Pulsatile Tinnitus in FMD; A Report of the United States Registry for Fibromuscular Dysplasia," Redah Zainub Mahmood; Jeffrey Olin; Xiaokui Gu; Eva Kline-Rogers; James Froehlich; J. Michael Bacharach; Yung-Wei Chi; Bruce Gray; Michael Jaff; Barry Katzen; Soo Hyun Kim; Pamela Mace; Robert McBane; Aditya Sharma; Christopher White; Heather Gornik, J Am Coll Cardiol. 2014;63(12_S). For more information on FMD, be sure to visit FMDSA.org. Information about the annual FMDSA conference, this year held on May 17, 2014, may be found here. UPDATE: The Cleveland Clinic links to Whooshers.com as a resource for FMD patients and the medical professionals who treat them.